Ragi is rich in many nutrients and provides Calcium for growing children and older adults helps improving bone strengthening, good energy source for weight watchers it gives the feeling of fullness when consumed,it beats high sugar and cholesterol. 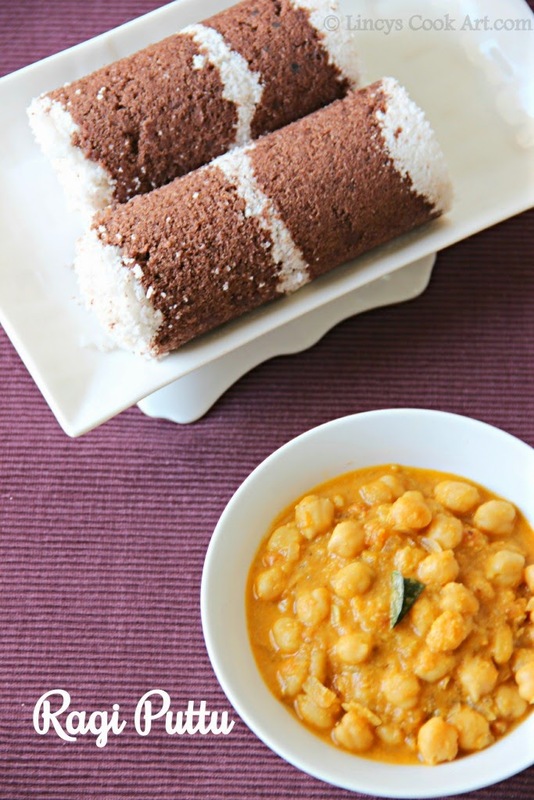 This puttu is a super easy puttu and if it is consumed with White/ Black channa curry (Kadala Curry) gives a complete nutritious wholesome meal with necessary carbohydrates, proteins and minerals necessary for our daily diet. I prefer White channa curry than Black channa curry especially for this puttu. Really tasty and also a healthy variation for the normal puttu can be eaten without any guilt. You can add very little coconut if you donot like to add coconut. If you do not get the roasted ragi flour take the flour and roast it on a low flame till you get the roasted smell of the flour. Transfer the roasted ragi flour in a bowl and add salt and water(unlike normal puttu it requires less water) and mix well with hand and wet the whole mixture. It forms some lumps also. Donot worry. Add the whole lot into a blender and pulse for two three times. Now you get the wet sand kind of powder without any lumps. In puttu maker cylinder keep the grating(Chillu), then add grated coconut, followed by two hand full of wet ragi powder then again layer with grated coconut then repeat the ragi powder layer and top it with coconut. Likewise fill alternatively the whole puttu cylinder. Close the cylinder with lid and keep on top of boiling water inside the puttu vessel, steam for 5-7 minutes till the steam comesout from the lid holes of the cylinder. Note: This puttu can be made with chirata puttu maker or even made inside the idli steamer by spreading the wet ragi powder on top of a white cloth too. Makes 2 cylinders(kutti) full of puttu. You might also like my similar Healthy Puttu versions Oats Puttu, Carrot Puttu, Banana Puttu. Wow, very healthy puttu. You made it very perfectly. Healthy & well prepared ,with lovely pic . I love that chole too. Healthy delicious recipe dear :) presentation is too tempting.. Healthy putti, ragi and coconut color rocks...yummy presentation. Healthy puttu, has come out really well.. Nice pics.. I can start my day with this nutritious combo,puttu and kadala curry makes me hungry.